sandileescraps: Crop Addict 5th Anniversary Blog Hop and Social Media Party! Crop Addict 5th Anniversary Blog Hop and Social Media Party! 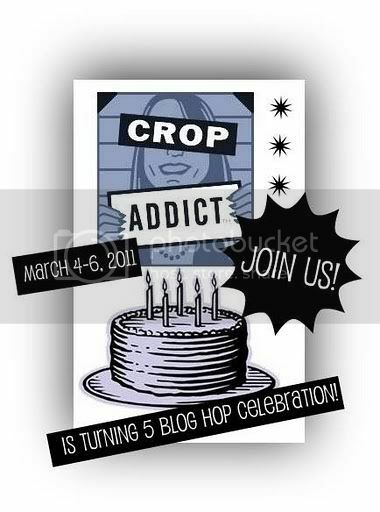 Welcome to the Crop Addict 5th Anniversary Blog Hop and Social Media Party! To celebrate, we will be sharing lots of inspiration on our blogs, the FaceBook page, Twitter and our forum throughout the weekend. That’s right – the party starts at 6am PST on Friday, March 4th and goes through midnight PST on Sunday, March 6th. We hope you’ll join the fun all weekend long! So here are the rules to our party. First, there is no limit to the number of entries you can receive into the prize drawing. Therefore, the more you visit all of our sites throughout the weekend and post comments, the more chances you have to win. But, only comments and posts made between 6am PST on Friday, March 4th and midnight PST on Sunday, March 6th count. 1. Visit the Crop Addict blog and earn one entry for each comment you post there. 2. Visit our Design Team Member’s blogs and earn one entry for each Crop Addict-related blog post you comment on. b. Sandi Johnson ...you are HERE!!! 3. Earn one entry if you become a fan of Crop Addict on Facebook and post on our FaceBook page that you became a fan . 4. Get one additional entry each time you post on the Facebook Page. 5. Earn one entry if you start following us on Twitter. 6. Get one entry each time you tweet back on Twitter. 7. Get one more entry if you join the Crop Addict forum . To log use this link: https://www.cropaddict.com/forum/login.php. 8. Get one more entry for each new topic you post on the Crop Addict forum. 9. Earn one entry for every product review in the Crop Addict shop. To log into the shop, use this link: https://www.cropaddict.com/shop/index.php?main_page=login. Please note that the shop has a separate log-in from the forum. A $5 gift certificate for everyone who plays. In order to receive the electronic gift certificate, you must setup a Crop Addict store account (https://www.cropaddict.com/shop/index.php?main_page=login). I'm offering an RAK too... to all of my followers who leave a comment on my blog this weekend! And if my follower number goes up by at least ten this weekend, I will give out two RAK's. On Monday, I will announce the winner(s). I love blog hops! I just became a follower too! I am a follower of yours and glad I am!